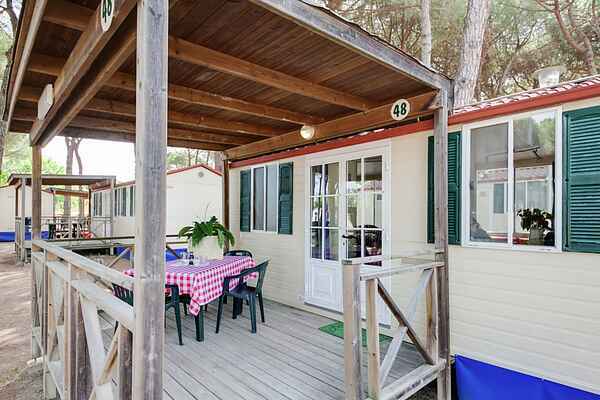 Mobile home in the green Mediterranean pine forest and a short walk from the sea. Far from the frenetic rhythms of the city and in direct contact with nature. For true lovers of nature only. A peace oasis for relaxing holidays in complete freedom. In the shade of the green pine forest characterizing the Mediterranean Coast of the Romagna Region. Nestled in the green pine forest of Cesenatico. This peaceful oasis is a few steps away from the charming Port of Cesenatico, on the Adriatic sea, between Rimini and Ravenna on the coast of the Region Romagna. 45.000 sqm are completely devoted to relaxation, away from the hustle and bustle of the cities and in direct contact with nature. The village is shaded by the Mediterranean pinewood, which characterizes the Romagna Coast, just a few steps away from the seashore. To ensure any kind of comfort, we offer our guests 67 mobile homes and 24 cottages, all in the shade of pine trees and furnished with all amenities, so that also younger guests enjoy a relaxing and comfortable stay in spacious living areas. Guests of the Village have full access to all services of the Camping nearby of the same owner, which is a few steps away and linked with a funny and completely cost-free little shuttle train. Swimming pools, wellness centre, whirlpool, fitness center, tennis, football ground, animation, mini-club, beach volley, table tennis, bowls, playground, 2 launderettes, Wi-Fi, bar restaurant, pizzeria, minimarket, two private beaches, piadina kiosks, sport area, and hairdresser are just a few steps away and make sure the guests find everything for an active and pleasant holiday. Characterizing features of the Village are undoubtedly the peace that reigns in the shade of the pinewood, the silence of nature and the serenity. It is the ideal place for those looking for a relaxing holiday in close contact with nature. Dogs of small / medium size (up to 30 kg) are accepted against payment if it has been previously comunicated. The additional persons (over 4) don't pay until 8 years. There is Wi-Fi, unfortunately, the signal can not reach everywhere and therefore there is a special internet zone. The bed linen and towels must be booked at time of booking and costs € 10,00 per person per change. Please visit Cesenatico, Rimini, Ravenna, Bologna!! !